Professional wide field of view Virtual Reality optics for less than the price of a couple of double lattes! A while back I demonstrated a design for Leep On The Cheap, a proof of concept for wide field of view optics on 3″ to 4″ display panels. Trouble was… there was quite a bit of distortion and chromatic aberration. However, it sparked quite a bit of thought and development in the VR DIY community. They’re the ones doing all the heavy lifting. So… it’s time to come back with another optical design for wide field of view VR, but this time the optical qualities are first rate and remarkably inexpensive. Of course there are a new set of trade-offs: field of view is limited to about 65 deg. (not bad, but not totally immersive), and I rely on somewhat smaller display panels, about 1″ to 1.5″ diagonal. This is roughly the same as the: Nvision Datavisor LCD, Visette Pro, and Virtual Research VR4/V6/V8. 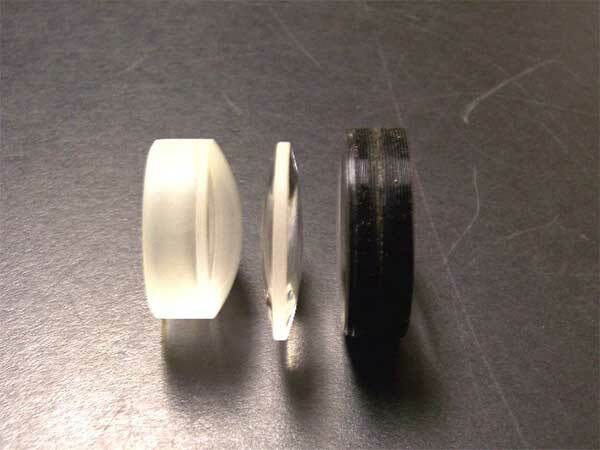 This design, and many commercial versions, rely a the unique characteristic of telescope eyepieces: that they can be directly used as HMD optics without modification. Even better, they’re made in fairly large quantity, with a large selection of optical characteristics and quality, and somebody else has already solved the issues of distortion, chromatic aberration, internal reflections, coatings, and aspheric design. Did I mention that they’re inexpensive. The sweet spot are either Erfle or Plossl designs; Erfle offers wider field of view. Even wider fields can be achieved with variations on the Nagler design, but the weight becomes prohibitively high. I’ll leave you hanging re: the LCD panel. The one in the video shown above was torn from a Virtual Research V6; low res, old school.